Metal maniacs, rejoice! 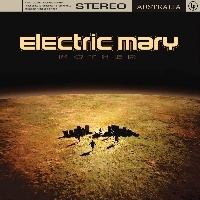 I am proud to present to you: ELECTRIC MARY; signed via Listenable Records, hailing from Australian grounds - performing Hard/Blues/Stoner Rock, on their 4th Studio Album entitled: “Mother” (15th, February 2019). Since formation in 2003; the band in question have 4 Studio Albums in their discography so far, I am introduced to their 4th album entitled: “Mother”. 8 tracks ranging at around 33:15, ELECTRIC MARY arrange an intricately designed formula of heavy-hitting Hard/Blues/Stoner Rock amalgamations. “Gimme Love” begins the record; conveying amplified adrenaline, attributing boistrously bouncy grooves… fuelled with flamboyantly composed catchiness – energized into blistering barrages of frenzied developments of hardened hymns and captivating creativity. Implementing diversely executed elements; hasty rhythms, showcasing vehemently versatile ultilizations of uniquely organic substance – supplying riveting musicianship and jumpy instrumentation in which provide wonderously prodegeious techniques. Consisting of Rusty on vocals; the frontman demonstrates a consistently complex distribution of clean pipes, raw singing and an adroit assist of energetic expertise. “Hold On To What You Got” integrates lacerating riffs and solos from guitar duo: Pete Robinson (on rhythm and backing vocals), & Brett Wood (on lead/backing vocals) …portraying primitively prestigious technicalities of progressive thunder. “How Do You Do It” embellishes on infectiously injected melodies of meticulous manifestations; remedious ramifications that submerge old-school aesthetics, detailing fluidly polished sound production perseverence while resulting originally refreshing songwriting memorability - persistently experimenting concrete grit, converged with rapidly swift nimbleness and relentlessly efficient dexterity. Audible bassist Alex Raunjak contributes a fair amount of battering licks; fabricated into enjoyably entertaining harmonies, pounding melodies that shine with solid slabs of thumping stability. “Sorry Baby” embellishes on anthemic contrast; orchestrating crunchy distinctions, constructed into distinguished dynamics and immersed with vast varieties. Drumming powerhouse Paul "Spyder" Marrett hammers his set with steely precision; songs like “The Way You Make Me Feel” pursuits and culminates elegantly quintessential quakes of rambunctious subjugations, salubriously dividing exquisitely behemoth forges of monsteriously meaty hooks in which chug and gallop ith profusely robust sophistication. Fusing a grandiose grandure of formulaic finesse; frolicking frantically into an angelic, bluesy opera of heavy characteristics. “It’s Alright” is another epic belter of electricity; establishing a borderline foundation of punchline professionalism, tight soundscapes and remarkable tempos that relish stylish systematics of seamlessly sonic skill. “Long, Long Day” explores inventive juxtapositions of prominent yet radio-friendly delights; engaged on enlightening fulfillments of excelling, humming chorus lines and an abundance of dancing snappiness that whips up unparalled specialities that is incredibly groundbreaking for this united sub-genre. Overall concluding “Mother” with the finale track: “Woman”; I am compelled to say that ELECTRIC MARY certainly outdone themselves with this one, if you are looking at investing some time and money on some unprecedented yet recognizable tunes - this score will reward you with ultimately supreme momentum.